Fourth of July meant a festive mood in the campground. The beach (just beyond the chain-link fence separating our campsite from the ocean) was hopping by 6:30 AM. Early morning surfers, campers staking out their Fourth of July beach spots and passing trains made it difficult to catch morning shut-eye. No snoozing for us! It was time to get up and finish this tour. As always, Danielle and Henry broke camp at the crack of dawn and were long gone before any of us began to stir in our tent. They planned to ride all the way to Border Field State Park, southwesternmost point of the contiguous United States, and the finish point for the Pacific Coast bike route, and back to San Diego before checking into their hotel. Since we didn’t even have a hotel reservation yet, we were at least 10 steps behind them! After we took down our tent and packed our panniers, we checked our phones and discovered there was a Starbucks across the highway. We thought we’d head over there for breakfast and to use their free WiFi to reserve a hotel. After multiple attempts throughout the week to make a hotel reservation using Tim’s slow and unreliable phone data connection, he just gave up. Nothing like waiting until the last-minute to get a hotel room on one of the busiest weekends of the year! At this point of the morning, we still planned to ride all the way to Border Field State Park, 43 miles away and then 17 miles back to San Diego. We’d heard from a few people that we could ride all the way to the border and then take the trolley back to San Diego. Everyone we’d talked to assured us that the trolleys would be empty and we’d have no problem rolling our tandems on. We’d worry about that later, first we had to figure out where we were sleeping that night. We pedaled over to Starbucks where Tim got a huge coffee, installed himself at a table near an outlet with his laptop and plugged in all of his devices and camera. As he started his somewhat complicated hotel search process, the kids and I bought drinks and pastries and plopped down at a table outside with our Nooks. To their delight, the kids learned it was “Yes Day” (an unplanned random day when mom says “Yes” to any request the kids throw her way). Can I have two pastries, mom? Yes! How about a Carmel Mocha Frappuccino? Yes! Kids love “Yes Day!” especially since they don’t happen very often. Tim’s hotel search process, which involves a combination of Kayak, Hotwire, Last Minute Travel, Priceline, and various other travel review sites and forums, frustrates me to no end. It takes forever to weed through all of that information. But Tim seems to enjoy it. Normally the hunt for the deal is his thing. He usually gets some nice rooms for not very much money so I certainly don’t complain! And after 25 days on the road, I was rooting for at least 4 stars, hoping for a luxury bathroom and high thread count sheets, too. Why not go for it and end our trip in affordable style? Our plan to ride all the way to Border Field in one day evaporated as the hours at Starbucks ticked by. After securing a hotel reservation and eating lunch, we revised our plan: ride to San Diego, check in to the hotel, shower, relax, get some dinner and watch fireworks somewhere in San Diego. We’d ride to the border and finish the tour the following day. We’re all about flexibility, remember? We mostly enjoyed the ride to San Diego: pleasant temps, mostly flat terrain and fun festive atmosphere through Solana Beach and Del Mar helped improve our moods. Beaches along the route were packed with families enjoying the beautiful holiday. 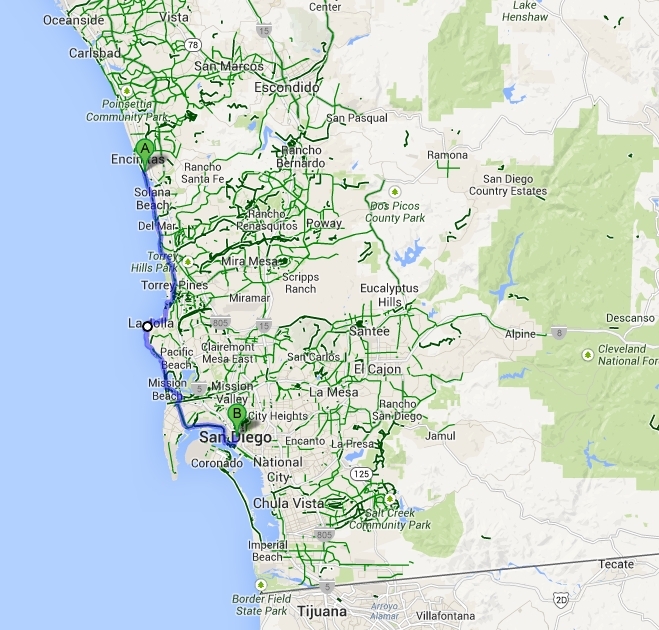 From Del Mar, the route followed a pretty hefty climb up through Torrey Pines. After Torrey Pines, we passed through La Jolla where we stopped briefly (very briefly) to enjoy the view and look at the harbor seals perched on the rocks. We didn’t stay long. By this time, it was early afternoon and the streets were jam-packed with tourists and drivers looking for parking on the Fourth of July holiday. Even though La Jolla is beautiful and we really should have appreciated it’s charm, we were all tired and so ready to finally be done with the tour. We just wanted to get there and ditch the bikes at the hotel! (I would have been happy to ditch those bikes forever at that point.) I must admit that I wished we could skip the scenic route and get there faster. The last 14 miles through Pacific Beach, and Mission Bay took forever. We finally arrived at our expensive but classy hotel in downtown San Diego. Ahhhh. Tired, hungry and sweaty, we were just happy to have made it. We were all so relieved! We’re in San Diego! Our journey has come to an end (well, almost—we still had to pedal to the border the following day). As Tim checked in, he asked the front desk staff where they would like to store our bikes during our stay. Do you want them in our room? Or someplace else? Knowing the hotel didn’t have a parking garage, he asked if they had a bike storage room (not uncommon in our experience). The front desk clerk said the bikes could be stored in the manager’s office adjacent to the front desk. The valet helped us roll the tandems into the office and gave us a claim check for them. Once the bikes were unloaded, we were on our way up to our room. We’ve stayed at all of the hotel chains Russ mentioned (with bikes). I didn’t know this was an issue. In fact, we’ve traveled with bikes quite a bit (and not small bikes either: two large tandems, two Xtracycles and a Dutch Oma), have stayed at a wide variety of hotels—Marriott, Hyatt, Kimpton, Hilton, the Wynn in Las Vegas, Holiday Inn, Comfort Inn and some small, lesser known chains —and have never had issues with hotels accepting bikes. We generally make our reservations in advance and then always tell (matter-of-factly) the front desk staff we have bikes. We then and ask where they would like to store the bikes during our stay. We don’t show up with a dirty bike and hope they’ll take us in. Maybe it’s our method—hotel staff seem very willing to help guests who know what they want; because we have an advance reservation we’re already guests —because at each hotel chain, the staff has always been gracious and accommodating about storing bikes. Have we just gotten lucky? Or has anyone experienced issues with bikes in hotels? Now back to the story … once the bikes were securely stored for the night, we hauled our panniers up to a lovely white room. 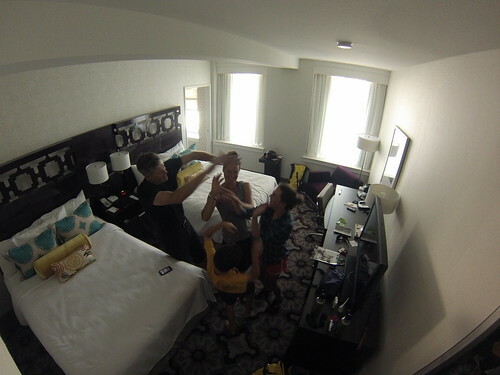 Once in the room, our mood still celebratory, we took a series of GoPro photos to document the moment (and the still clutter-free state of the room). Celebration aside, Mom wouldn’t let anyone sit on the beds or even touch the crisp white comforters until they showered. And she was a little bit mean about it. “The comforters are white, don’t sit down, and don’t touch anything until you take a shower!” Since the kids wanted to watch some TV before dinner, and they needed somewhere to sit, they argued about who could shower first. Once we were all clean and rested, we ventured outside for dinner. Our friend recommended the best burger in San Diego, and I think she was right! 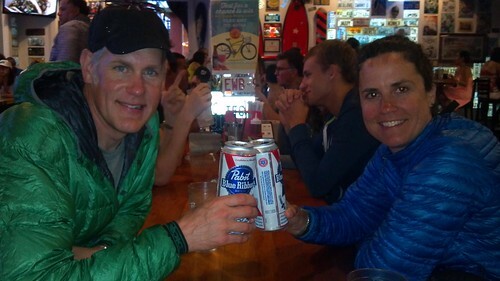 Mmm… burgers and fries and onion rings and PBR, the best meal we could hope for after a long day (month!) in the saddle. After dinner, we wandered down to the water for a Fourth of July fireworks show overlooking the USS Midway and other US naval legends. It all felt pretty darn patriotic. 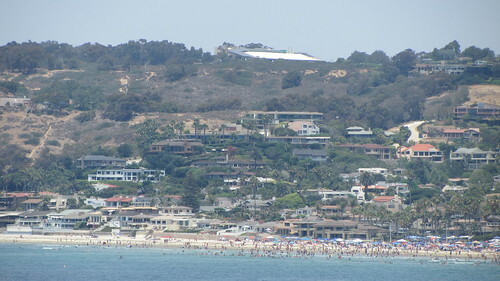 High: Arriving in San Diego! This entry was posted in bikes, Pacific Coast Bike Tour and tagged 2013, acapaccoast, bike tour, bike touring, bikes, CA, carfreedays, family bike touring, Family Cycling, finish, Fourth of July, July, kids, Pacific Coast Bike Tour, San Diego, tandem, tandem bike tour, two tandem bike tour. Bookmark the permalink. This is a great series. And I’ve never had a problem checking my bike at any major hotel chain, either. Putting in the room is no problem, or I’ve left it in the luggage room downstairs (useful after checkout). I assumed based on this experience that taking a bike to a hotel was a complete non-issue. Ohmigosh I sort of love that you were stuck in our old ‘hood (PB) on my former self’s favorite day of the year. I can’t imagine being stuck down there in my old age now–eek. If your former self jaywalked, with a beer in hand, crossing right in front of my tandem in PB (now I know the cool term for the hood), my current self probably would have given you the mom stare. I went over my handlebars once, slamming on the brakes to avoid a surprise pedestrian. BTW, I bet it’s really hard to endo on a tandem! I think I was a careful walker and never got in anyone’s way. And Dan was very steady as he biked me around on his handlebars while I held our beers.